Create as many ringtones with this free ringtone maker app as you like. We have set no restrictions on the number of ringtones you can make for your Android device with our ringtone application. So you can create unlimited ringtones for your device now! Edit the music files present in your Android device and create your own ringtone in less than 30 seconds. With this cool ringtone app you can also record your own ringtone. The easy interface allows all users to make the best use of this application on all sorts of Android devices. 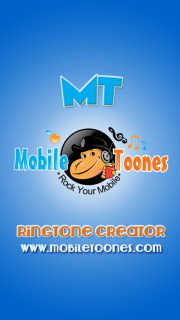 Whether you have an Android phone or Android tablet, this ringtone app will make ringtone setting a fun and easy job. Record your own ringtone. Now you can record a ringtone in your own voice, how cool is that! How do I create a ringtone with MT Ringtone Maker App? Open the MT Ringtone app first. A list appears with all the songs/music files available in your device (no hassle to go looking through all song lists in your mobile). You can even type the name of the audio file in Search box and search for it. The ringtone editor appears. Now with the help of slider controls in the ringtone editor make your own ringtone. Play and check if the ringtone is just what you wanted. Rename and save the ringtone as music, alarm, notification or ringtone. How do I record a ringtone with MT Ringtone Maker? Open the MT Ringtone app. Click on 'Record New' button. Click on the 'Record' button and start speaking or recording the sound. Click on 'Stop' button when you are done. Play and see if the recording is fine. Click on Use this Recording button to Save the Ringtone. Create your ringtones for free and enjoy!